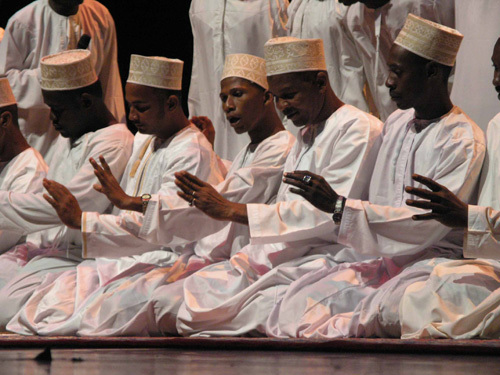 The Mtendeni Maulid Ensemble performs a visually arresting style of Sufi religious devotion called Maulidi ya Homu in Zanzibar. The form has roots in the ancient Arab world, but today survives only in Zanzibar. Maulidi ya Homu is associated with the tariqa ‘Sufi order or brotherhood’ founded by Ahmad al-Rifa’i. The Rifa’iyya originating in Egypt has spread over the Near East, but also as far as Indonesia, the Comoros, and Zanzibar. 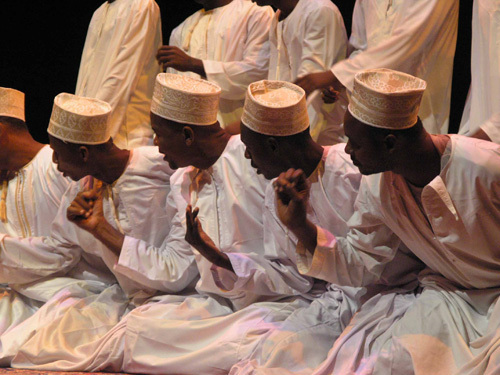 The form of Maulidi ya Homu performed today is thought to have originated from Iraq and came to Zanzibar around 1800. Over time the performance has become distinctly Zanzibari blending local ngoma traditions with more general Islamic elements. Maulidi ya Homu ya Mtendeni is led by Sheikh Majid Said Mansour who founded the group in the mid-1960’s after learning the tradition from his grandfather. Originally, the group was Maulidi ya Homu ya Mwembe Tanga, but with time the name changed to reflect the current neighborhood the group now occupies. Since its inception the group was very popular and remains the one of the most active and best-liked Maulidi ya Homu groups in Zanzibar until today. 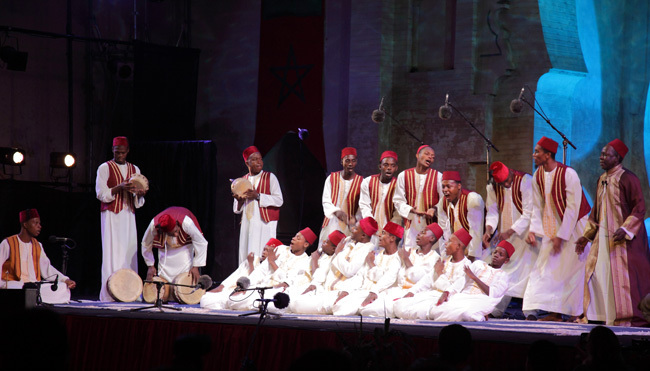 The main performance group members are: Barua Ussi Khamis rusi, vocals, bandleader; Suleiman Juma Ali khalifa, lead vocals, tasa; Hassan Juma vocals, chorus; Ali Mbarouk Mzee matari ; Njanga Pandu Machano, Hamad Njani Hamad tari; Alawi Said Khamis, Makame Juma Salum, Sultan Salum Shindano Farhan Mussa Khamis, Sleyum Mohamed Sleyum, Adil Samir Ali, Yahya Issa Ahmada, Ibrahim Haji Aley, Abdalla Mussa Khamis, Hamid Hashil Mohamed, Haji Jaffar Kassim, Said Shamte Mohammed, Alawi Abuu Hamad chorus, choreography. Maulidi ya Homu is performed during various social celebrations such as weddings, birth celebrations, circumcision ceremonies, etc. 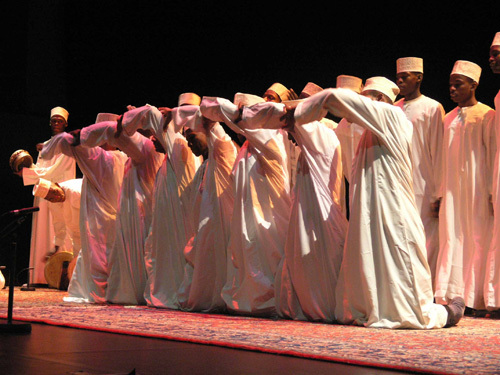 A distinctive form of maulidi, a performance celebrating the birth and life of the Prophet Muhammad, Maulidi ya Homu serves a significant function and role in Muslims celebrations in East Africa. 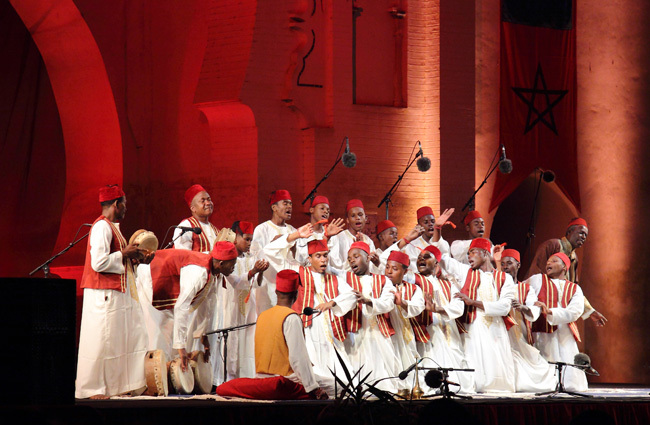 Performed by Sunni Muslims in Zanzibar, Maulidi ya Homu is recited in Arabic and Kiswahili. The performance is opened with a communal recitation of shorter suras from the Qur’an. Then the group commences with an a capella introduction led by the khalifa or msomaji ‘reader’: He establishes a basic rhythm and tone, which gradually crescendos into a sound that fills the entire space. In due course he accompanies his voice by an ever faster rhythm beating on a brass tray with a wooden stick. 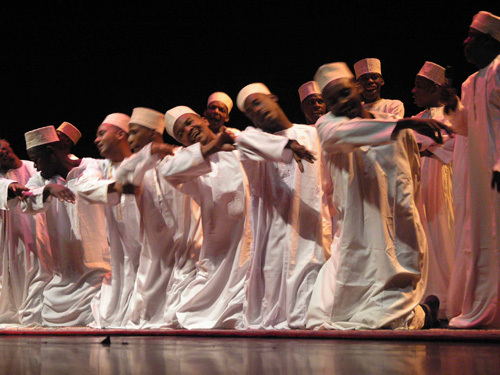 Progressively arm and hand movements are introduced performed by a row of men and boys of all ages – dressed in white kanzu ‘djellabiya’ and kofia ‘hats’ – in the front. The rusi (leader of the group’s physical motions) coordinates this part of the ensemble. The remaining performers stand in a second row behind them, they sing the chorus parts and dance swaying from one side to the other. As a third and final component the voice and movements are joined by matari ‘frame drums.’: Starting out calmly and slowly, the performance gradually increases in volume, tempo and dynamism of movement, up to an animated climax. These sections are called dahala. A performance generally consists of three or four dahalas and is closed by a du’a ‘supplication.’ One person also serves as the shawishi ‘group’s waiter’ who throughout the performance burns udi ‘aloe wood’ and ubani ‘incense’ and sprinkles marashi ‘rosewater’ over the performers and the audience. The front line is the visual center of attention: kneeling down they slowly start with poised hand movements and gradually introduce the head and the whole body. The dance is composed of smaller segments each with names that are being announced by the rusi who chooses whichever choreographic unit he sees fit to the intensity of singing. The movements range from gentle gestures with hands and head to motions reminiscent of Muslim prayer to a fast to and fro clasping each other’s arms and rhythmical clapping over the head. The kofia hats may also be laid out in front of the dancers then waved around holding them with the teeth. Another unit includes the dancers bending backwards and lying down completely before rising up again. The sometimes acrobatic quality of movements demands stamina and zest of the dancers. All the while singing chorus lines as well they perform an amazingly varied and intricate choreography. During each dahala section qasida ‘praise poems’ are sung in a medley-like fashion, one merging into the next. The qasida are either in Arabic or Swahili and topically praise God and Muhammad, describe the duties of Muslims, relate knowledge of heaven and hell, and celebrate life. Although it is a cultural performance, the religious benefits are highlighted, as those hosting the performance hope to receive baraka ‘blessings’ and the social respect of celebrating within a community of Muslims. ››For international booking inquiries please contact Jahazi Media. 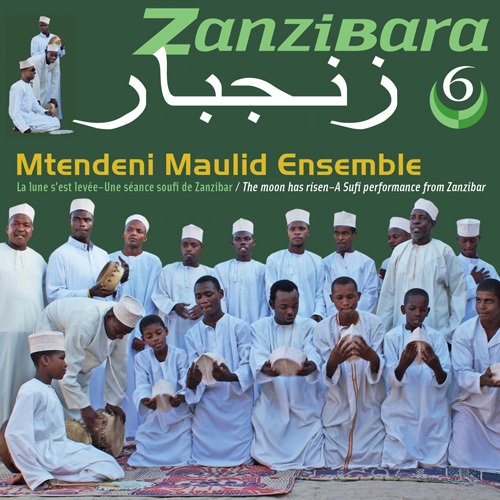 ›› The Mtendeni Maulid Ensemble is also featured on ZANZIBAR MUSICAL CLUB produced by Les Films du Present in association with Jahazi Media.